By PEARL LIU in Hong Kong, May 2016. Jakarta has so much rubbish that it is running out of disposal space. The capital of Indonesia, Southeast Asia’s biggest economy, generates a staggering 10,000 tons of waste every day, waste that is dumped in a giant landfill on the outskirts of the city. Untold tons of garbage never make it to the landfill but end up in and along the Ciliwung River, which flows through the giant urban area. Millions of local residents live along the river’s now-dirty banks. By one estimate, the equivalent of seven soccer fields of waste ends up in the river each day. Indonesia is now second only to China as the biggest contributor of plastic waste in the world’s oceans. Indonesia is representative of what is happening across Southeast Asia. The region’s giant piles of waste are growing, along with the region’s population and its penchant for consumption. Recycling is minimal and there is little awareness of its importance. Not only is this garbage jeopardizing the soil, rivers and human health but it is also becoming a barrier to economic development. “We are embarrassed that we are one of the world’s worst ocean polluters,” said R Sudirman, waste management director at Indonesia’s Ministry of Environment and Forestry, at a national seminar on waste management last October. As of 2015, the average Indonesian citizen produced 0.7 kilograms of waste every day. With a population of 250 million people, that means 175,000 tons of waste was created each day. That adds up to 64 million tons every year, according to data from the ministry. Weak policies, lack of public awareness contributing to growing waste problem. Just 1.9 percent of all this waste is recycled. Most recycling programs carried out by community-based or non-governmental organizations have failed due to a lack of public awareness. She added that people would typically just follow their pre-existing pattern of throwing their plastic waste into the river, burning it or burying it in the sand. The greatest damage, she said, comes from plastic entering the ocean. Eaten by fish, it will eventually enter the food chain, damaging everyone’s health. According to the World Bank, as much as 440 million tons of waste is generated annually across the region. This adds up to 36.7 percent of the garbage collected worldwide. East Asia and the Pacific region generate around 270 million tons of garbage per year. The Chinese mainland alone makes up around 70 percent of this regional total. This, he said, has led people to behave in a more or less traditional way, which involves packing all waste together and dumping it without separation. India, in particular, has a problem with waste disposal. The country generates about 60 million tons of trash every year. New Delhi alone generates about 9,000 tons of solid waste and most of that is dumped into four landfill sites. According to a 2011 report by India’s Central Pollution Control Board, New Delhi needs at least 263 hectares of landfill space, four times the sites’ current capacities. India’s Centre for Science and Environment also reports that only 15 percent of household waste in the country is recycled. Perhaps more telling is not only the lack of awareness in developing countries like Indonesia, India and China — and smaller countries like Cambodia — where infrastructure is not yet mature, but also in more developed economies like Hong Kong and Singapore. The domestic recycling rate fell to 19 percent in Singapore last year and over the past five years Hong Kong has gradually been recycling less and less. Only 2.05 million tons of waste was recycled in Hong Kong in 2014. This was 5 percent less than in 2012 and 43 percent less than in 2010. Last year, local volunteers at 27 sites in Hong Kong collected an average of 391 pieces of debris from every 5-meter stretch of beach. “We all imagine that the city should be in a higher league as we are such a wealthy place with so much resources and intelligence, but unfortunately we are quite far behind,” said Christensen of Eco-Vision Asia. The HK$1 billion ($129 million) recycling fund was launched late last year. If nothing else, it should signal a push toward greater awareness. Across Southeast Asia, there are a number of programs that could make a difference. The Mother Earth Foundation, a non-governmental organization in the Philippines, has started a pilot zero-waste program in some barangays, the lowest level of government in the country. The foundation is working with some local officials. “At the beginning, it is very difficult because local people do not understand segregation (of waste) and why we need it. We have to knock door-to-door and teach them how to do it step by step. The education process took us about eight months to one year,” said Sonia Mendoza, chairperson of Mother Earth Foundation. The hard work has paid off in some areas. Barangay Fort Bonifacio, located in Taguig City, Metro Manila, was the first city the foundation rolled out the program to in 2012. It has since said goodbye to tons of litter and turned an old dump site into a materials recovery facility. Mendoza added that the foundation has signed agreements with a number of barangays and is “planning to extend the program to five to 10 cities in Metro Manila in the next couple of years”. Christensen said that she has observed a visible change in terms of awareness and education. “That is a good sign. But we need to turn the awareness into action. We are not quite there yet, in terms of moving from the level of awareness to how we should act,” she added. There are other examples of successful programs. Taiwan now has one of the highest household recycling rates in the world, at roughly 46 percent. In 1997 it set up a fund to encourage recycling and reduce waste, and both producers and importers now pay a fee based on the cost of collecting and recycling. South Korea and Japan have also put programs in place that could act as a template for other nations across the region. But concerns remain about the speed at which awareness is being raised. Could the humble orange peel hold the key to preventing prostate cancer? Could abalone blood be a treatment for herpes? How about using leaves from cherry tomatoes to slow down the progress of Alzheimer’s disease? These are just some of the possibilities that could emerge from research now underway at the University of Sydney involving food waste. “We are not looking so much at household food waste but waste from food processing,” said Fariba Dehghani, director of the Australian Research Council Food Processing Training Centre. “So much is wasted when we process food, but that waste could be turned into products that could have tremendous health benefits worldwide,” she said in her office at the university. Dehghani leads a small team of researchers looking at ways in which waste from the multibillion dollar food-processing sector can be used in the fight against diseases such as cancer and Alzheimer’s. Each year around 1.3 billion tons of food produced for human consumption globally is lost or wasted. According to the Food and Agriculture Organization of the United Nations, that figure includes 45 percent of fruit and vegetables, 35 percent of fish and seafood, 30 percent of cereals, 20 percent of dairy products and 20 percent of meat. Much of the waste ends up in landfills or used as animal feed or compost. So, can oranges help to prevent cancer? “Perhaps,” said Dehghani. “Our work is in its early stages but the signs are promising.” She added that the peels of oranges and other citrus fruit contain many anti-cancer agents. Each year around 1.3 billion tons of food produced for human consumption globally is lost or wasted. The National Cancer Institute in Australia said oranges are a complete package of every natural cancer inhibitor known. Oranges, along with other citrus fruits, contain phytonutrients that have attracted a lot of attention from scientists, she said. The oil in the orange peel contains a phytonutrient known as limonene. Dehghani explained that oranges, mandarins, lemons and limes contain significant amounts of limonene in the peel and smaller quantities in the pulp. A lot of food waste is also rich in nutrients that are vital for people’s health and well-being and can be used to fight diseases, she said. 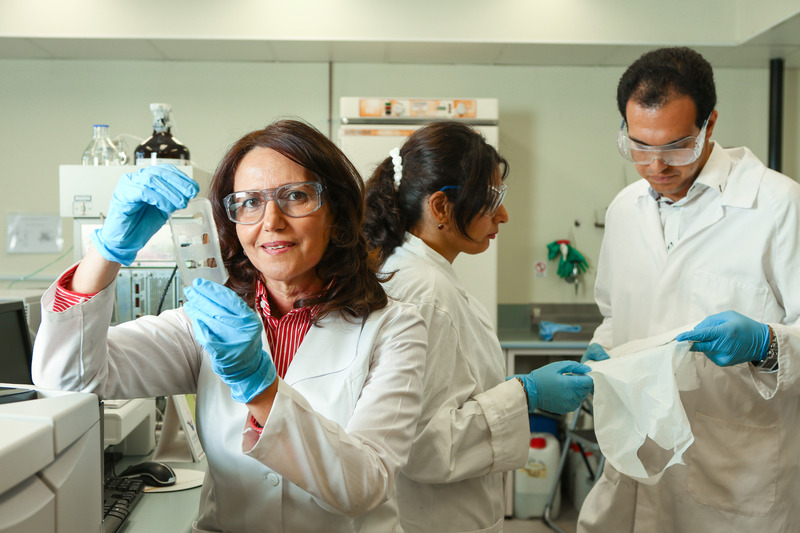 Much of the research being carried out by Dehghani and her team is being funded by a large grant from the Australian Research Council and the private sector. Food-processing companies are starting to see the value in their waste and want to do more with it, she said, so “they come to us with a problem and ask if we can help”. “People today want natural products because they are thinking about prevention rather than treatment. Dehghani noted that initial research shows limonene from orange peel could reduce the cells that cause prostate cancer. However, the clinical trials alone could take years, “but the possibilities are there”, she explained. One project which shows a great deal of potential involves abalone. But when he started to do work involving the handling of abalone, she added, the warts disappeared. According to Dehghani, the powerful antiviral properties of abalone blood appear to block the entry of the herpes virus into cells. “Our research so far with abalone has been very positive. So much so that the proteins from abalone blood may eventually lead to a more effective treatment for cold sores and herpes. The key compounds can then progress to clinical trials but it depends on a range of factors including financing, she said. Another project her team is currently working on involves cherry tomatoes. “The company we are working with has a problem with waste and, in particular, the leaves of the cherry tomatoes,” Dehghani said. “There is a possibility the waste from tomato farms contains a compound that can be used to slow the onset of Alzheimer’s, one of the diseases affecting our aging population. Although the findings do not present a cure, she added, they could have a major global impact on slowing the disease down. In her view, “much of what the food industry wastes each year can be turned into natural products that could have a profound impact” on our well-being. The recycling of electronic waste (e-waste) is an extremely hazardous way to make a living. In India, it is estimated that 50 million workers perform this dangerous job. Worse still, many of those employed to do this are children. These minors dismantle discarded computer monitors, motherboards, cathode ray tubes, printed circuit boards, mobile phones and chargers, headphones, air conditioners and refrigerators with their bare hands. In order to extract metal pieces and plastic from e-waste, the child laborers burn the discarded components. This releases toxic fumes from the lead, cadmium, mercury and other heavy metals that are embedded in the e-waste. The plight of these children and the other so-called informal workers (a gray economy of workers that is neither taxed nor monitored) was highlighted in a joint study by the Associated Chambers of Commerce and Industry of India (Assocham) and Frost & Sullivan, a market intelligence firm. Published on April 21 — the eve of World Earth Day — the report said nearly 500,000 child laborers in India face serious health risks as they are involved in the dismantling of e-waste without any protective gear. “These children might suffer liver or kidney damage because of exposure to toxic fumes,” BK Rao, chairman of Assocham, warned in the report. Despite the extremely hazardous nature of the e-waste recycling process, 90 percent of e-waste is still recycled by the informal sector, the report reveals. India produces nearly 1.8 million tons of e-waste and this quantity is growing at the rate of 25 percent annually. It is estimated that by 2018 India will produce 3 million tons of e-waste. To tackle the two-pronged problem of e-waste — the health hazards faced by the workers and a growing pile of toxic refuse — the Indian government announced new rules on March 22 to deal with the issue. India’s Ministry of Environment, Forest and Climate Change (MOEFCC) has come up with an “extended producer responsibility” section under the new waste management rule. This makes it mandatory for manufacturers to ensure that 30 percent of e-waste is collected by 2018. This responsibility will further increase to 70 percent by 2023. It also brings compact fluorescent lights and similar products that contain mercury under the scope of the new rule. It is now mandatory for electronic product manufacturers to carry out publicity and consumer awareness programs for the collection of e-waste. In order to motivate consumers, manufacturers are now bound to include a consumer deposit-refund plan. As part of the plan, manufacturers will charge an additional amount as deposit when a consumer purchases an electronic product. The deposited amount, along with interest, will be returned to the consumer at the “end of life” of the electronic product — when the sold item is returned to the manufacturer. When the rules were announced, Prakash Javadekar, India’s minister of state for MOEFCC, warned that “there is also a liability clause with financial penalties”, when environmental degradation happens and “things are not being done scientifically” with regard to the production, sale and recycling of electronic products. Similar waste management rules were also formulated in 2011, which made producers responsible for the handling and recycling of e-waste. The rules also elaborately explained the procedure for extracting metals from e-waste. However, much of the on-the-ground reality, with regard to recycling of e-waste, did not change due to the respective state and central governments’ failure to implement these rules. Satish Sinha, associate director of Toxics Link — an advocacy group for clean, sustainable alternatives — pointed out that in the absence of any waste-recycling target, the producers have no obligation to follow the rules. However, a new rule announced by the Indian government empowers the Central Pollution Control Board to conduct surprise inspections. The new rules will come into effect in October this year. “The rules have good provisions, but without proper implementation they will be good only on paper. It will be important to see how these rules are implemented,” said Priti Mahesh, senior program coordinator at Toxics Link. Inaction has also become a matter of concern for private recyclers that invested in new technologies to recycle e-waste. BK Soni, chairman of Ecoreco, a Mumbai-based e-waste recycling company, said: “Poor implementation of laws has resulted in irresponsible companies and consumers. They dump e-waste wherever they feel like.” He said that the current cost of collection and transportation of e-waste also “raises the cost of recycling”. The new e-waste management rules seek to gradually push out the informal sector from the recycling of hazardous e-waste. But such a move is likely to impact the livelihood of 50 million waste pickers, dismantlers and recyclers in the informal sector. To combat this, around $3 million has been allocated under a skills development program to upgrade the skills of 300,000 waste dealers in the next 10 years. Soni explained that this skills development program is an icebreaker in relations between the informal and formal recycling industries. “We are providing training for the safe handling of waste. At the same time (this skills development program will) ensure their livelihood (is secure) with a proper payback (after the completion of the training period),” Soni explained. Still, underlining the scale of the task in implementing such a plan in a huge country such as India, the skills training programs are being conducted only at a few locations. To compound matters further, it will take another six months for the new rules to come into effect. The release of the Assocham-Frost & Sullivan report on the use of child labor in recycling e-waste has put pressure on the Indian government to implement e-waste management rules with an iron hand. In 2014, India ranked 155 out of 178 countries on the Yale Environment Index. India has also announced a new plastic waste management rule, which bans plastic bags with a thickness less than 50 microns (around half the thickness of a human hair). It also extended plastic waste management rules to rural areas and directed bulk producers of plastic products to segregate waste. India produces nearly 15,000 tons of plastic waste each day. Of this, nearly 9,000 tons of plastics are recycled, while 6,000 tons end up in dump yards or flow into the sewage system. Another major shake-up in the recycling of waste in the country involves the management of construction and demolition waste. India has an infrastructure development plan with a budget of 70 billion rupees ($1 billion) but it has only three construction waste treatment plants. Of the three plants, only one is operational at the moment. Apple has sold more than 750 million iPhones since Steve Jobs stepped on stage in San Francisco to “reinvent the phone” more than a decade ago. Since then, smartphones and tablets have flooded into the lives of people around the world. Few people keep these devices more than a year or two. So what happens with the hundreds of millions of old units? “I have asked many of my friends and families this question and most of them said that they just put it in a drawer because they do not know how to deal with it and do not know the consequence of improperly disposing of their electronic devices,” said Eric Liu, toxics campaigner at Greenpeace East Asia, the regional office of the global environmental organization. Electronic waste, or e-waste, consists of everything from scrapped TVs, refrigerators and air conditioners to old desktop computers, digital cameras and now tons of end-of-life phones and tablets. Together, these devices represent the fastest growing waste stream in the world. “Normally household waste is not a hazard. However, electronic waste is different. If those materials are not managed well, for example, dumped into a regular trash can and ending up in landfill, they are a hazard. They will seep out into the environment, contaminating land, water and the air,” said Ma Hwong-wen, director of Graduate Institute of Environmental Engineering at the National Taiwan University. Electronic products are made up of hundreds of different materials and contain toxic substances such as lead, mercury, cadmium, arsenic and flame retardants. For example, an old-style cathode ray tube computer screen can contain up to 3 kilograms of lead. Up to 42 million tons of e-scrap was generated globally in 2014 — the equivalent of 1.15 million heavy trucks, according to a report by the United Nations University. The total volume of e-waste is expected to reach 72 million tons by 2017. In 2014, Asia generated about 16 million tons of e-waste. The three Asian countries generating the highest e-waste are China, 6 million tons; Japan, 2.2 million tons; and India, 1.7 million tons. Asian countries generating the highest e-waste are China, 6 million tons; Japan, 2.2 million tons; and India, 1.7 million tons. What makes the situation worse in Asia is that huge amounts of e-waste are exported to developing countries, according to a recent UN report. China now appears to be the largest e-waste dumping site in the world with about 70 percent of materials ending up there. Unprofessional and illegal dismantling results in further damage. Guiyu, a city in South China’s Guangdong province, is in the spotlight of the global environmental community for its recycling of e-waste. In 2013, it was recorded as the largest e-waste site in the world. “Villagers, who are the recyclers here, work in family-operated stores — or some could only be called stands — on every street, ripping out the guts of household devices with hammers, buzz saws and pliers,” said Liu from Greenpeace. The organization described the village as “an e-waste nightmare”. 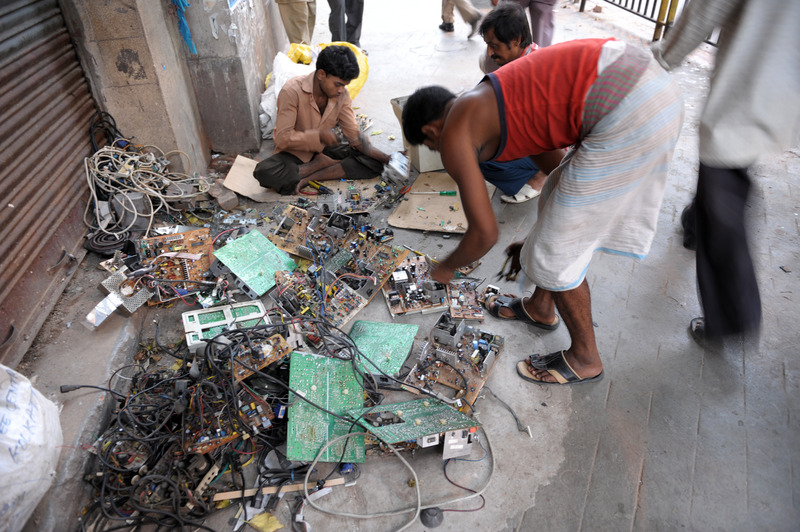 The villagers extracted welded electronic components from abandoned devices, which are polished and sold as second-hand components or burnt to get valuable metal. Guiyu is not the only place where this happens on the Chinese mainland. Kaizhou in Zhejiang province and Qingyuan in Guangdong province are similar. Likewise, there are many other places in Asia that recycle e-waste. Informal recyclers in Bangalore, India, usually family-owned businesses, simply hack open electronic products and extract whatever they need. “(The informal recyclers), like many other traditional street recyclers in developing countries, such as Indonesia and Malaysia, do not have access to protective clothing or equipment and they do not know how to handle the toxic chemicals that are later released into the environment,” said Ma from National Taiwan University. Though more dangerous than household solid waste, electronic trash is different in another way: It can generate profits. “There are valuable materials such as metal, particularly precious metals, (which) are excellent electrical conductors. I think there are at least 30 kinds of metals inside cellphones. Those things have to be reused,” said Ma. About an hour’s drive from Taipei, Super Dragon Technology Co, one of Taiwan’s biggest recyclers, has built a new plant that uses old CDs, DVDs and computer motherboards to produce energy-saving shade tiles. This is the latest effort on the island, which is pioneering new ways to handle e-waste and has been doing so for three decades. Founded in 1996, the Taiwan-listed recycler earned $88 million in 2014 through processing electronic refuse and harvesting a variety of metals, including gold, from junked electronic components. Currently, the company can produce gold at about 99.99 percent purity. “We are doing pretty good now in extracting precious metals from electronic waste. However, we’ve put our eyes on the rest as well, which are not precious metals, but could also be valuable with the right technology,” said Lu. Regional cooperation might be a fast fix for the current situation though, Ma explained. “Every place has its own characteristics, its own resources and technology advancement in recycling. For example, Taiwan has good technology to reuse materials from cellphones, but at the current stage that (technology) is not as good as Japan,” he said. There have been proposals to set up a regional e-waste recycling system that takes advantage of local expertise. “It is a kind of matching of resource and the demand for the products, but it needs regional cooperation, and not (be limited to) one country,” said Ma. It is still early days, however. The good news though is that some change is underway. Last December, in Guiyu, a new Circular Economy Industrial Park was set up to move all family e-scrap stands on the street to a 1.5 billion yuan ($233 million) recycling plant. In March, Yan Oi Tong EcoPark Plastic Resources Recycling Centre, which has been operating in Hong Kong for six years, announced plans to shutter by the end of this year. The closure signifies the cost concerns stifling the recycling industry not just in Hong Kong but across Asia. “Recycled plastic was exported at HK$6,000 ($770) per ton last year. The number has plunged to HK$3,000 per ton now, or about 50 percent,” said Lau Yiu-shing, chairman of the Hong Kong Recycle Materials and Reproduction Business General Association. “Many factories prefer to buy virgin materials,” he added, referring to resources extracted from nature in their raw form, such as metal ore or timber. Frontline recyclers are also having a hard time as the price fetched by waste plummets. Scrapped metal has been hardest hit as it is now recycled at HK$700 per ton, sliding 52 percent from HK$1,450 per ton at the beginning of 2015. Paper is recycled at HK$700 per ton, down by 36 percent, and plastic bottles fetch HK$1,000 per ton, down 23 percent from the rate seen at beginning of last year, according to the Hong Kong Recycling Chamber of Commerce. “There is no incentive to push recyclers to pick up disposals and it is also not realistic for recycling companies to send out cars and collect them directly, as their profit has already been squeezed heavily due to much lower-priced recycled products,” said Lau. Dropping prices are foreshadowing a long winter for recycling. Even in Japan, which is considered a model of recycling in the region, many private operators are barely hanging on. Scrap metal was selling for around $220 in January 2015 but fell to around $123 per ton by November. Despite a rebound in some regions earlier this year, prices are still at historic low levels at around $140 per ton. If prices continue at the present level, it will remain difficult for car recyclers to profit from their traditional end-of-life vehicle (ELV) collection and dismantling operations. Over the past decade, the Japanese government has encouraged the recycling of ELVs through funding and regulatory changes. However, the sector has now been hit by headwinds. According to the Japan Automobile Recycling Promotion Center, ELV collections from April to September last year declined by around 90,000 units from a year earlier, to hit a record low of 1.62 million. Falling scrap steel values “make recyclers hesitant to purchase vehicles at auto auctions”, the center noted. All over the world, recyclable prices are shrinking as the rate of raw commodities. When looking at recyclables, Wong said, the price of recovering the waste materials is now more expensive than buying raw materials. “So there is no good incentive,” he added. Take plastic, which is linked directly with petroleum, as an example. Crude oil and natural gas will be refined into petrochemical products like gasoline and fuel for cars. But some other products like ethane and propane are “cracked” into simpler molecules such as ethylene and propylene through high-temperature furnaces. Combined with catalysts, these are then converted to polymers and will turn to small pellets through several procedures. Manufacturers finally turn the pellets into finished plastic products like bottles. So the cost of manufacturing new plastic closely tracks the ups and downs of global oil prices, which have fallen more than 70 percent since June 2014, sinking at the beginning of this year to levels not seen since 2003. As a result, recycled plastics have lost much of their price advantage and have become less competitive. Cosmas Lu, spokesperson for Super Dragon, a listed recycling company in Taiwan, said: “We have seen bricks and cement prices continue to drop. Our recycled construction materials cannot compete with them. Copper fell to a new six-year low in January followed by a slight recovery. It is currently traded at $4,870 per ton on the London Metal Exchange and copper stocks have seen a 38 percent decrease this year. Iron ore, a key ingredient of steel production, also hit a post-2008 record low. Industry players have called on governments to step in and lend a hand. Wong from Hong Kong Baptist University said that some people believe recycling is part of “the free economy” and the recycler does not need to be subsidized. “But they forget that waste is not a private commodity,” he added. Waste is from the public. That means the government is responsible to handle it. The government should pay a service charge if they ask the recyclers to handle it. People should think about it as a service charge and not a subsidy, Wong added. Recycling funds, which have been in place in Taiwan, South Korea and Japan, have played that role. The governments pay the recyclers to continue collecting materials when prices sink. In Taiwan, environmentally friendly construction materials, once approved, can be sold at a 10 percent discount with the government making up the difference. Recycled materials perfectly fit the criteria. “Only this can support the use of recyclable (materials) for the production of secondary products. I do not think there is any other magic,” said Wong. Wong cites the recycling charge of HK$250 when buying a computer in Hong Kong. At the end of computer’s life span it is then passed on to a recycling company. This is called a producer responsibility program, Wong said, adding that it is a better approach than “loading the burden all on the government’s shoulders”. Handouts can definitely ease the problem and can be a first step, but the lesson learned in well-developed recycling markets, like in Taiwan and Japan, is that people must also do their share. “To further push the recycling business, people should change their mindset,” said Lu from Super Dragon. In most Asian countries, he added, the public are less willing to accept recycled material products when they have the choice of those made from virgin materials. “Supporting recycling for a lot of people is still lip service and they are not willing to reach into their pockets and buy products reproduced with recycled stuff,” he said. The idea that people need to live their lives in harmony with the Earth was planted quite early in Sonia Mendoza’s life. “I was very close to nature since I was a little kid,” said Mendoza, founder and chairwoman of Mother Earth Foundation, a non-government organization that works to reduce the amount of waste produced in the Philippines. Mendoza has always been a nature lover, but she did not become an environmental activist until late in her life. After graduating from Ateneo de Naga University — a private research university — with a degree in chemistry, she became an analyst with the multinational pharmaceutical company Parke, Davis & Company, a subsidiary of Pfizer. There, she had what she calls a “smooth” career path, working her way to a senior analyst position and laboratory manager. At first glance, her professional background seems to have little to do with her current focus in life and work, but that is not entirely accurate. There are some surprising links. “I am good at playing with molecules, formulas, and all the props in the lab, so I chose chemistry, which was not really related to the environment at that time. “I realized that much of the knowledge I learned can actually be utilized now to explain how poor management of waste will damage our environment — for example, the toxic material left in soil and water if we dump waste directly without separation,” she said. For Mendoza, a mother of four, children are always a top priority. Looking to spend more time with her kids, she decided to retire early, in the prime of her career. “I was suddenly afraid that they would all get married soon and I would not have much time with them. So I decided to resign when my husband’s job was good and stable enough to support the family,” said Mendoza. At that time, her eldest daughter was 16 and the youngest son was 9. She spent the most “relaxing and beautiful nine years” cooking, cleaning and being with her family. Mendoza also picked up tennis again to create a healthier lifestyle together with her family. However, she got a wake-up call when her sister-in-law’s asthma worsened. “We tried different therapies, but it turned out that it was the dirty air that made her condition worse,” Mendoza said. “In the early 1990s, there was already so much air pollution, the water was not clean any more, and there was plenty of (waste) on the streets of central Manila.” Mendoza realized that a healthy diet and a tidy apartment was not enough for her family to lead a healthy life. “I watched on TV and read on newspapers that so many (people) were suffering from diarrhea, asthma and allergies because they consumed water and food contaminated by the piles and piles of garbage in the neighborhood,” Mendoza said. So, she rolled up her literal and metaphorical sleeves and got back to work with a group of 15 others, many of whom were also mothers and grandmothers. In 1998, the group founded the Mother Earth Foundation. The organization focuses on waste problems they believe are at the “root” of various kinds of pollution and diseases. Without any funding, the members went house to house to educate people about how to sort their household garbage and recycle. By promoting the zero-waste concept, they proved that waste management is still doable without a big budget. Mendoza first rolled out her zero-waste program in 2012 at Barangay Fort Bonifacio, an area of Taguig City in Metro Manila. The urban barangay has a population of 20,000 from middle- and low-income families and now has a waste diversion rate of 80 percent. They also turned an old dump site into a material recovery facility, cutting waste-collecting truck trips from four per day to just one, which saved around 10,000 Philippine pesos ($210) every day. The city of San Fernando, capital of the northern province of Pampanga, is another zero-waste model city that is 100 percent compliant to Republic Act 9003 with the help of the Mother Earth Foundation. It now has 80 material-recycling facilities for the city’s 35 barangays. “These two models prove that for ecological waste management, local governments do not need expensive, high-tech and harmful waste-disposal facilities like incinerators,” she said. Now Mendoza and her foundation, which has expanded to more than 260 members during the past two decades, are moving their focus to bigger areas. She said local governments reward barangays that do well in waste segregation and recycling. Mendoza is also looking to increase the national waste management law’s 30 percent compliance rate to a much higher level. “This (current compliance rate) is very low considering that the law was passed more than 16 years ago,” she said. 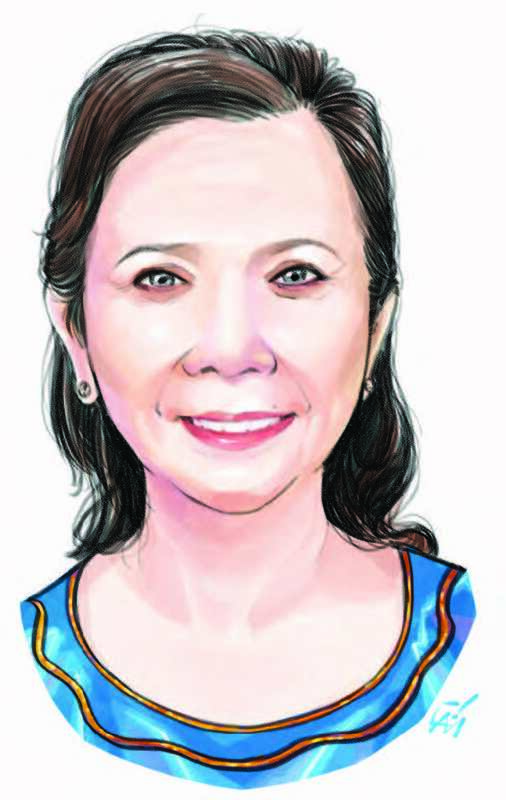 “The Philippines has one of the most beautiful laws on solid waste management in the world if it is properly implemented.” If Mendoza has her say, it will be.